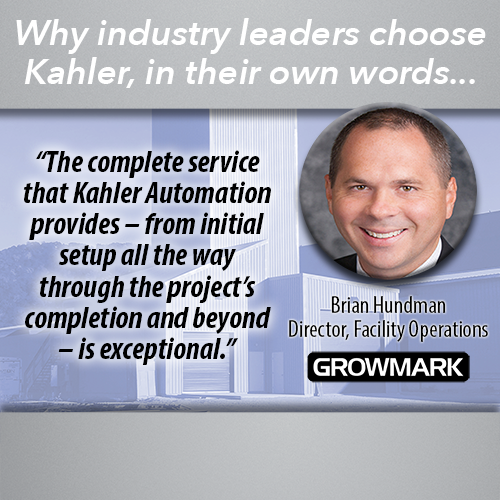 When these facilities needed process control, they called Kahler Automation. Luckey Farmers, Inc. facility in Bradner, Ohio. Luckey Farmers’ Bradner, OH, team (from left): Dakota Wendt, Tyler Schwartz, Jim Walter, Gary Schober, Shane Coger, Adam Brossia (Branch Manager), Keith Shively, Chris Voland, and Mike Joseph. Mass flows for fertilizers, two bays on each side. Mass flow meters for chemical inject. KA-2025 kiosk for access to self-serve unstaffed bay. Pre-wired MCCs manufactured in Kahler Automation’s UL control panel shop. Pumps for outdoor storage tanks. Touch-screen access in self-serve unstaffed bay. The customer was looking at designing a facility very similar to its Graytown location, with a few modifications. Luckey Farmers had an existing UAN tank on-site that was not automated; the tank was in a good location to serve current customers and grow with them as they expanded. The company wanted to add a 24/7 bay to allow it to serve its customers without an employee on-site. In addition, it needed other liquid fertilizers to do some blending, as well as chemical dispensing that would utilize bulk chemical tanks and shuttles. All of this had to interface with its existing agronomy and accounting software to make billing easier and less time-consuming. Kahler Automation started with the design from Luckey Farmers’ Graytown, OH, location, adding a 24/7 bay for a total of three bays. We used separate meters for each bay so they had the ability to simultaneously dispense straight product or splash-blend in the truck out of all bays at the same time. We also provided meters for the bulk chemicals, so they could inject into the carrier line for hot loading or divert to pistol grips to fill shuttles or trucks. We provided a weigh tank with the ability to inject chemicals from shuttles or hand-added materials for hot loading on less-used products. Kahler Automation provided a pre-wired motor control center that saved labor and simplified the electricians’ job onsite. Kahler’s Terminal Management and Plant Supervisor software were able to interface to their accounting package, tying everything together and reducing paperwork for their office staff. Luckey Farmers is able to successfully stage orders allowing them to maximize use of all three bays at once. In collaboration with Sackett Waconia, a 200-ton blend tower with four-ton high-intensity mixer (HIM) was developed; a liquid impregnation system was designed by Kahler. An accompanying straight product tower allows wholesale trucks to be loaded quickly. A custom chemical and liquid fertilizer facility was designed for prescription blends to be made. Both straight product and hot loading is available. To meet United Farmers Cooperative’s lofty efficiency goals Kahler Automation’s designs included a 24/7 unstaffed load-out bay, with technology allowing UFC customers to pick up scheduled fertilizer orders at any time, day or night. Heritage Cooperative's Marysville Ag Campus is located northwest of Columbus in central Ohio. The facility has a storage capacity of 28,800 tons of dry fertilizer. The facility has a grain storage capacity of 3.3 million bushels. The facility can store 10,800 total tons of liquid fertilizer. Kahler's Motor Control Centers (MCC) are assembled and quality tested in-house. The facility has a dry fertilizer receiving capacity of 700 tons per hour, and loadout of 185 TPH. Kahler Automation panels control reclaim systems, micro bins, distributors, and more. 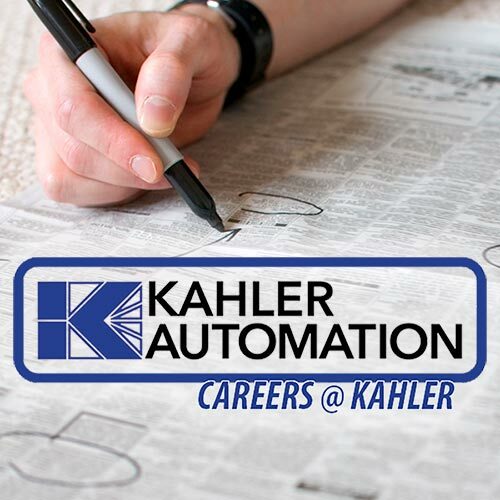 Kahler Automation's 24/7 unstaffed load-out system features a large touchscreen interface. The facility features mini-bulk filling and container tracking, controlled by Kahler systems. A two-million-gallon tank is double-walled and located within the confines of a concrete dike. A loop track design gives the facility the ability to receive and ship product by unit train capacity. To meet the challenging goals of Heritage Cooperative, Kahler Automation designed a facility that included a 24/7 unstaffed loadout bay with technology that enables customers to pick up fertilizer 24 hours a day. A 200-ton blend tower with 3-ton High Intensity Mixer was developed with Kahler designing a liquid impregnation system. Liquids can be sprayed simultaneously so speed is not compromised when impregnating. Kahler Automation's grain system allows the entire grain operation to be monitored and controlled from anywhere on the control network. Grain can be moved anywhere in the facility by multiple source/destination selections, controlled by a touchscreen, requiring only one person.